Here is a way to get lots of greens in with this green salad with pecans and pears. It is naturally sweet and when you add some pecans it becomes incredibly delicious. We know how important it is to get those greens into our body every day so here is a way to enjoy them. 1. Simply toss all ingredients with dressing. Delicious Green Salad – a green salad with a difference. Healthy Carrot Salad – unique and so tasty with black currants, sunflower seeds and lots of carrots! Simple Nutritious Spinach Salad – with only two main ingredients, this is a fast salad to make. 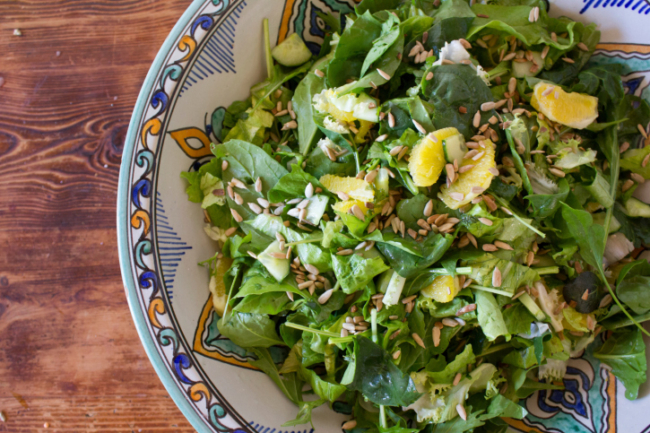 Power Spinach Salad – full of healthy greens that is one of the highest alkaline forming foods. Wow ,I love all of your recipes, healthy and yummy. Thank you Sheila, healthy and yummy is the way with real food.